This was another nostalgic trip for me - I think Beverly Hills Cop was the first film I decided was my 'favourite of all time'. (I then moved on to Batman, Terminator 2 for a few years, then LA Confidential (I think), Goodfellas, Dazed and Confused, Ghost World, Mulholland Drive - and now, probably Chinatown). Mind you, I was about 7 or 8 at the time. I think part of that was because BHC was one of the first '15' rated films I was able to see - so there was plenty of gun fights, bad language and explosions to enjoy. Also, at that age I decided that Eddie Murphy was just about the coolest man on the planet - for further details see last week's entry on Trading Places. I'm not sure I've rewatched BHC since I was about 13, but generally, it holds up pretty well. 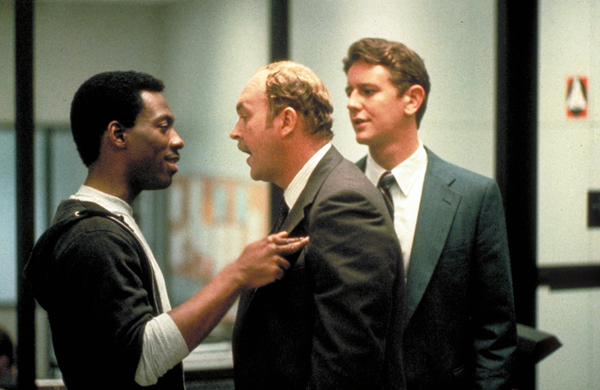 Despite the film using almost every cop movie cliche in the book (just about the only thing I didn't see was the chief asking for Axel Foley's badge and gun), it's tremendous fun. Eddie Murphy still seems pretty fresh, the wisecracks and jokes mostly hit the mark, and the soundtrack's just as iconic as ever. Unfortunately, the sequel doesn't really deliver. The plot of BHC 2 is basically the same as the first one, and the script seems engineered to give Murphy as many chances as possible to bluff his way into uppercrust establishments, but everything rings rather hollow and stale here - no-one's heart really seems to be in it. There's also a series of really poor 'jokes' about Billy (Judge Reinhold)'s obssession with firearms and other deadly weapons, which don't work the first time, and get increasingly irritating as the film keeps going back to the same well as the movie progresses. The local arthouse cinema (The Watershed) is showing a season of films scored by Bernard Herrmannm, and as I wasn't doing much on Sunday, I thought I'd go along to a screening of this 1950s sci-fi classic. Apparently, this was the first movie to use theremins as a basis for the soundtrack (a theremin is an early form of electronic instrument) - a sound which is now widely associated with science fiction. The movie was interesting - a few of the primitive special effects got a laugh or two from the audience - but for all of the alien invasion plotting of the first ten minutes of the movie, for the most part, the film is far more concerned with terrestrial matters. The alien, Klaatu (who amazingly looks just like us), has come to Earth in order to teach us foolish earthlings (or, if you're John Travolta, 'man-animals') that the nuclear arms race on Earth is imperilling our planet - and that if the major powers can't agree to a truce, alien powers will destroy the Earth to prevent us from harming anybody else. 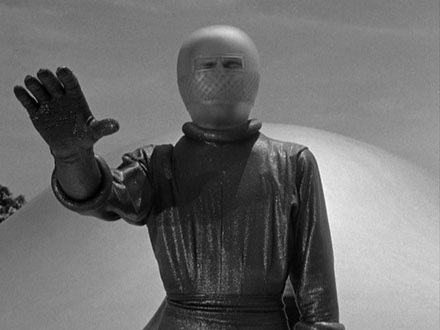 There are a few cheesy moments in the film (particularly the subplot where Klaatu befriends a 10 year old boy), but it's still an interesting film today despite the rather dated effects. In which a family residing in a new build suburb in California are scared out of their wits by a spate of telekenetic activity in their home. 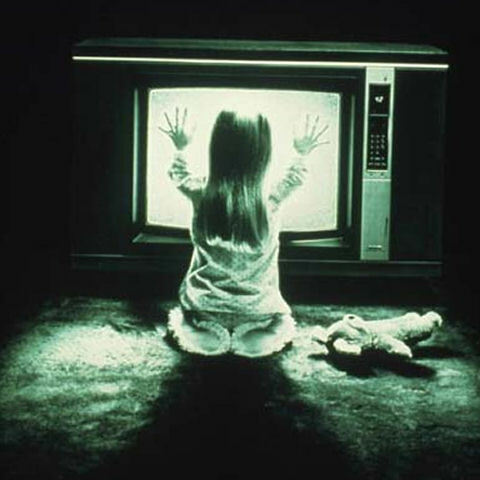 Their youngest child, Carol Anne, seems to have a particular connection with the 'TV People' who have entered their house, and during one night of particularly violent activity, is sucked away into a the spirit world. This was another movie I decided to rewatch, having not seen it for a few years. When I initially saw this picture, I must have been about 18, and not being quite so desensitised to horror movies, I found it pretty scary. Now though, it doesn't have the same effect, though there are one or two good frights to be had (particularly the scene where one the researchers investigating the phenomenon has an hallucination which involves him tearing the skin off his face). Still, it's a well made movie, exploring similar themes to other Spielberg movies of the era (E.T., Close Encounters etc), but with rather a darker tone. This can be explained by the fact that Texas Chainsaw Massacre's Tobe Hooper was the director here, though apparently he was heavily supervised by Spielberg in his role as producer. Rather disturbingly, I read that both of the actresses who played the family's two daughters both died young in unusual circumstances, which puts rather a different perspective on viewing the film for a second time. A movie which focusses on the relationship between two former college roommates, played by an excellent Paul Giamatti and an almost equally impressive Thomas Haden Church. 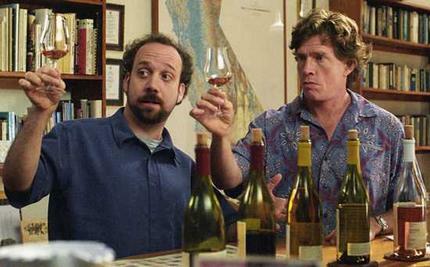 The two amigos have long since grown apart - Giamatti is a depressive wine expert, attempting to get his novel published whilst still reeling from his divorce, Haden Church is a sleazy actor still living off the glories of a minor soap opera part he had eleven years ago - but decide to head to Northern California for a last hurrah before Haden Church is married. 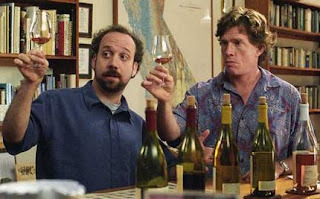 While Giamatti is hoping to spend time in the Wine Country sampling different grape varieties and playing a relaxed game of golf, Haden Church is desparate to have one final fling with somebody - anybody - before his impending wedding. All of this is the set up to an eventful week for both men, told at a relaxed (but never boring) pace. The film doesn't shy away from showing the dark sides of both of these characters, but you feel attached to them all the same. A really top notch comedy, and (rather surprisingly, given it's somewhat explicit content) my Grandma's favourite film of recent years.